Airline Avianca says it will stop flying to Venezuela due to operational and security reasons. The Colombian company is the latest to suspend its flights to the South American country amid a growing economic and political crisis. US airline Delta also announced in a tweet that it was suspending services to Venezuela from mid September. Aeroméxico, Air Canada, Alitalia, Latam, Lufthansa and United Airlines have already stopped their flights. Avianca has operated in Venezuela for 60 years. The airline, one of the biggest in Latin America, said customers who had bought tickets for flights departing after that date would be reimbursed fully. 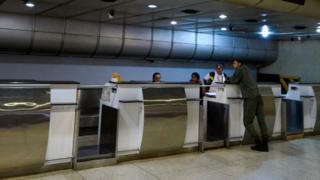 Airlines still operating flights to Venezuela include Air France, Iberia, Air Europa and TAP, but Venezuelans have complained about the increasing difficulty of getting flights in and out of the country. What is behind the turmoil in Venezuela? Many used Avianca's twice-daily Caracas to Bogotá route to connect with other flights. With fewer flights available those having to book at short notice sometimes struggle to get seats. The Venezuelan women's volleyball team missed the world grand prix tournament in Canberra, Australia, on the weekend. The team had to use chartered planes because a shortage of seats stopped them taking commercial flights to Australia, Venezuela's chargé d'affaires Daniel Gasparri-Rey said. But when the chartered planes were delayed and it became clear the team would arrive too late to take part in the tournament, they turned back, the diplomat said. The Venezuelan Volleyball Federation could now face a fine of up to $30,000 (£23,800) for missing the matches. Player María José Pérez said the team members felt "frustrated" because they had been robbed of the chance to make an impression at the tournament, for which they had qualified for the first time.